As the numbers on the calendar flip like the speedometer on an old trusty car, historians still have to be careful when they refer to the "last century." Thankfully there are those that pay close attention to where we've been; and where we might be headed. Noted author and historian Frank Dale reviews some out-of-the-way places and groups you may get acquainted with this year. Gold mines are hard to find in our area but at least one still exists... in Montague, in Sussex County. Tucked away in the very northwestern corner of our state, hugging the beautiful rural Delaware River, is a very dedicated historical group with the impressive name of The Montague Association for the Restoration of Community History. And these people do an impressive job. Accompanied by Alicia Batko, the group's official historian, I attended a weekly work session recently at the group's headquarters in a nicely restored home, now museum, identified as the Foster-Armstrong House at 320 River Road, Montague. Mr. Foster built the rather large house in 1790. James Armstrong married a Foster girl and both families lived here together. The Armstrongs were living here until the Federal Government took it over in 1970 as part of the proposed but never-carried-out Tocks Island Dam project. 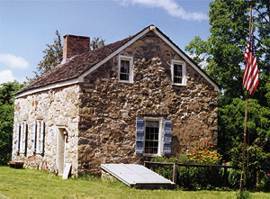 Today, this historical society operates the Foster-Armstrong Homestead and also the Neldon-Roberts Stonehouse at 501 Route 206 in Montague. The township's population, incidentally, is now 2500 good people. In the summer, tours are given through both houses and they are open Sundays to the public. Both of these homes are on 5-year leases by the U.S. Department of the Interior. 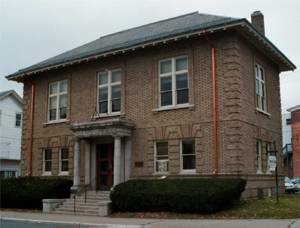 The historical society has no rent to pay but must maintain the buildings, heat them, furnish them with historical items, and keep them open to the public for historical exhibits and programs. This group does it, gladly. Every room is furnished or used to display historical items. Some pieces go back to the early period in the area's history. There's a Native American room for Indian items, and one room is filled with military uniforms, some from our recent military activities. The old attic is being converted into a special display area. The historical furniture, pictures, papers, cooking utensils, clothing items, and so forth, are primarily from the local area and given by local people who feel this museum is the safest place for them. They are probably right. The Association publishes a newsletter for its members four times a year and members are invited to submit articles to appear in it. The Association holds its historical programs the last Thursday of each month at 7:30 pm at the Foster-Armstrong House but refreshments start earlier, at 7:00 pm; everybody is invited. Take Route 206 almost to the Delaware River Bridge but make the last right turn, Route 521, before you cross the bridge. Go about 3/4 of a mile. The Foster-Armstrong House is on the left. The office phone is (973) 293-3106. Or visit the association's website. One of our most rural, old, and beautiful counties is served by what is rapidly becoming a first-rate historical association. The Sussex County Historical Society is located just one block from the center square in Newton in the unique Hill Memorial Building at 82 Main Street (Route 206). This organization was founded in 1904 and the stone structure that is its home, library, and museum, was constructed with funds given by county citizen, Joshua Hill, in 1916. The two-story and basement structure, loaded with extensive collections of historical texts, maps, photos, 3000 glass photo plates made from 1880 to the 1920s, farming and manufacturing items, and much more; and with a large second-floor meeting room, was placed on the State and National Register of Historic Places. The building is the oldest historical museum in New Jersey and is owned and maintained by the County of Sussex. This structure, and its organization, is just concluding a massive renovation and modernization. The group's new leadership, headed by President Robert Longcore, and an ambitious and vigorous Board of Directors and staff, is organizing a series of programs to be held in this fine building. It is also planning to offer extensive support and programs for local community historical organizations. Under preparation now is a program about the building itself and its rich past with emphasis on new collections that are available here. In addition, President Longcore is inviting each municipal historical society in the county to place a display of some of its items on a rotating basis for three to four weeks and to offer an evening program relating to these featured items. Each Saturday the local group will be expected to offer a Saturday morning program entitled; "Just for Kids and Their Parents". When the restorage is finished, probably by January, meetings will be held here again on a regular schedule. Directly across Main Street from the museum is the original cemetery in Newton, the Old Newton Graveyard, where the evolution of grave stones and the technique for restoring them is studied. This cemetery dates back to 1762 and for the next 100 years after that, was the only cemetery in town. It is studied and used as a teaching tool by the Historical Society. If lately you've sensed a rebirth or recovery beginning in old Phillipsburg on the Delaware, you're right; and the group right up front, leading the way, is the Phillipsburg Historical Society. This active group is led by young Wayne Sherrer who has high hopes for the Society's ability to make life richer for the old-timers and the new arrivals. The Phillipsburg Historical Society has a three-room library, museum, and office in the lower level of the Municipal Building at 675 Corliss Avenue, in Phillipsburg. The first room, as one enters the facility, is the organization's historical library with a wide selection of books relating to the town and its surrounding area. There are numerous Morris Canal books here-Phillipsburg is the location where, in 1824, the canal began-and similar sources dealing with the Delaware River, or covering such industrial local giants as Ingersoll-Rand, Andover Iron Company, and Warren Foundry. Many of the documents and maps date back to the last century. The room also contains a genealogical collection listing a large number of local families, copies of the publication Genealogical Magazine of New Jersey, and other genealogical publications. The place has an extensive photographic collection with a major contribution by local photographer and historian, Ron Wynkoop. The second room contains some 37 vertical file drawers and 10 large horizontal file drawers. which contain a vast amount of local information. Old tax maps are here as well as large and growing collections of the many newspapers that serviced the area. A good-sized table occupies the center of the room for the convenience of working historians. The third room is a storage room containing a sizable amount of material that needs inspection, classification, and filing, a positive indication for a working historical association. These rooms are open for research every Monday morning from 9:00 to 12:00 and usually on Friday mornings as well. Special appointments can be arranged for a researcher who needs additional time, at the phone numbers listed below. In addition, the Society mails five news letters to all of the 120 members of the group before each of the five meetings held each year. Each news letter contains historical information and also announces the topic and speaker of the forthcoming meeting. The group meetings are held at a different location than the museum-library; they are held at the Phillipsburg Senior Center, 310 Firth Avenue, Phillipsburg. They are held on the fourth Thursday of January, March, May, and September, and the third Thursday in November to avoid a conflict with Thanksgiving Day. The meeting time is 7:30 PM. For phone contact for further information, the numbers are: (908) 213-1409 or (908) 454-0816. Make a point of visiting the library or attending a meeting of the Phillipsburg Historical Society. You won't regret it. This special institution is located in Milford, Pennsylvania, on 608 Broad Street. From New Jersey come into the center of town to a traffic light and turn right. That's Broad Street. The street runs along the west shore of the Delaware River. The building is several blocks up Broad Street on the left. When the Pike County Historical Society was founded in 1930, its first President was Giffard Pinchot, who was also one of the state's outstanding governors. The Society's quarters are in a large mansion, originally the twelve-bedroom summer home of a rich Jersey City politician about a century ago. It consists of three floors and a basement, all presently in use. It was purchased by the Pike County Historical Society in 1983. The building is in immaculate condition with beautiful pictures and photos on the wall. The rooms are large and spacious, comfortable appearing. Thousands of volumes of reference books are here, biographies geographies, military books, an endless supply of old magazines. Newspapers abound recorded on tape. On my recent visits, there were always several people there to help me locate information in the building or to tell me where else such information could be found. Several rooms are lined with historical and genealogical exhibits. For example, exhibits relating to the county's Civil War activities are on display. On show now, too, is an exhibit entitled "Rural Economy". There is on display here the authentic stagecoach "Hiawatha", which operated between Port Jervis and Dingmans from 1860 to 1920. And coming up soon, an exhibit on the 1864 wreck of the Civil War prisoner train in nearby Shohola in which many Confederate prisoners were killed. 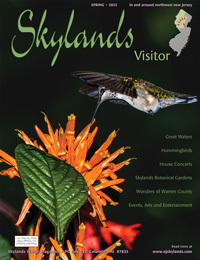 Make a point of visiting this very special place in eastern Pennsylvania on our Delaware River. You won't be sorry. Library hours are Wednesday through Sunday from 1 to 4 pm, and this offers exhibits, genealogy and the local county history library. The charge for one use of the institution is 50¢ for a child, $3 for adults, and if the librarian can provide you with genealogy information, the charge is $15. Or you can become a full member of this organization at a cost of $15 for the year and use the library freely and receive the first-rate historical booklets in the mail regularly. I joined. 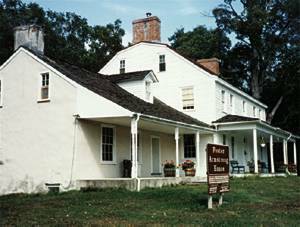 Freelance writer Frank Dale is noted for his portraits of places of historical note in northwest New Jersey. In addition to years of writing for newspapers and periodicals he has published Delaware Diary, a book filled with fascinating episodes in the river's life. He also publishes an ongoing series of engaging booklets called the Warren County Chronicles.